Archives : LAST ENGULFING TOP - 30/09/2011. LAST ENGULFING TOP – 30/09/2011. Market was as indecisive as it can be. Gain one day was lost the next day and vice-versa which had left the traders confused. Currently it is sandwiched between two gaps viz. an Upside Bullish Gap (Nifty 4879-4905) which is acting as a Support and a Downside Bearish Gap (Nifty 5059-5109) which is acting as a Resistance. Any move either upward above the gap or downward below the gap, will lead to a strong movement in that direction. Next week is likely to see a decisive move either up or down. The Sensex opened the week at 16209, made a high of 16756, a low of 15801 and closed the week at 16453. The Sensex gained 291 points on a weekly basis. Similarly Nifty opened the week at 4878, made a high of 5034, a low of 4758 and closed the week at 4943. The Nifty too closed with a weekly gain of 76 points. Once again the daily and weekly candlestick patterns are not confirming with one another. On the weekly charts, both Sensex and Nifty have formed a Bullish Harami pattern which is a Bullish Reversal pattern. This pattern requires a confirmation and we will require a white body candle to be formed next week. On the other hand if we consider the current upmove which started from Monday, then there is a Last Engulfing Top formed if we consider Wednesday and Thursday’s candle stick pattern, which is a Bullish Engulfing pattern at the top. This is a bearish pattern and warns of an impending trend reversal. The confirmation of this was in the form of a black body candle formed on Friday. Since the weekly and daily charts are not in unison, one can expect the volatility to continue. Both the indices bounced back on Monday after making a low of 15801 on the Sensex and 4758 on the Nifty, thus they did not breach the intermediate low of 15765 on the Sensex and 4720 on the Nifty. Thus the Nifty movement is now restricted to a range of 4720 on the lower side and 5170 on the higher side. Last week when the indices fell after reaching the top end of the range i.e. Sensex 17191 and Nifty 5168, both the indices have left behind a Bearish Falling Gap between Sensex 16833-17000 and Nifty 5059-5109 which is acting as a strong resistance area. This week, both the indices went higher leaving behind Bullish Upward Gap between Sensex 16209-16282 and Nifty 4879-4905 which is acting as a support zone. Current movement of the market (i.e. last four days) is restricted between these two gaps. Further movement of the market will be dependent on which gap gets filled first. Both Sensex and Nifty once again flirted with the short term moving average of 20dma (Sensex – 16688 and Nifty – 5014) but finally closed the week below that, and hence the short term trend is down. The market is well below the medium term average of 50dma (Sensex – 17062 and Nifty – 5129) and long term average of 200dma (Sensex – 18317 and Nifty – 5496). As a result the medium term and the long term trends continue to remain down. The Pull-back was stopped at Sensex 17191 and Nifty 5168 which happens to be just below the last time’s pull-back level and i.e. at Sensex 17211 and Nifty 5169. Besides these minor tops, there is a convergence of various resistance levels like the Trendline Resistance, and 38.2% of the intermediate fall. Thus we have strong Resistance zone formed at Sensex 17171-17311 and Nifty 5150-5188. From a broader perspective the market is correcting the entire rise from 7697 to 21108 for the Sensex and 2252 to 6338 for the Nifty. If the market breaches the recent low of 15765 for the Sensex and 4720 for the Nifty, then the market is likely to move towards the 50% and 61.8% levels of the entire fall for the Sensex and Nifty. Those levels are 14402-12820 for the Sensex and 4295-3813 for the Nifty. Both Sensex and Nifty had given a weekly Bearish Head & Shoulders breakout and the target for that falls at 14651-13928 for the Sensex and 4357-4143 for the Nifty. After that the weekly Bearish Descending Triangle got completed and the target for that falls at Sensex 13952 and Nifty 4200. On a smaller degree, there is a Bearish Cup and Handle formation and the target for that falls at 14789 for the Sensex and 4437 for the Nifty. On a still smaller degree on the daily charts there is a Bearish Breakout for an Ascending Triangle formation and the targets for which should be Sensex 15306 and Nifty 4572. 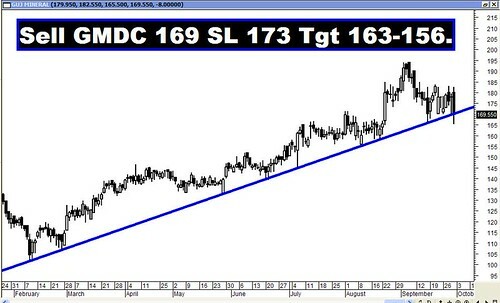 MACD has given a whipsaw last week and is currently giving a Buy once again even though in a negative territory. ROC is in negative zone and has given a Sell signal. RSI continues with its Sell signal as it failed to move above the centerline and fell from there. The Stochastic oscillator has given a Buy signal as %K is above %D. ADX has moved to 19 suggesting that the index is in sideways mode. Directional Indicators which are in Sell mode as –DI is above +DI but the drop in the value of –DI is alarming. OBV continues with its lower top and lower bottom formation and hence continues with its Sell signal. Money Flow on the other side continues with its Buy signal as it is still at 65. Nifty OI PCR has gone up and is currently at 1.58. Highest Call writing is seen at 5200 strike price and highest Put writing is seen at 4700 strike. Thus in the near term, one can expect the Nifty to oscillate between 5200 on the higher side and 4700 on the lower side. Trendline Resistance for the Sensex is at 17171. Trendline Support for the Sensex is at 15810. Trendline Resistance for the Nifty is at 5160. Trendline Support for the Nifty will be at 4769. For the week ahead, Sensex will find Support at 16119-15801-15463 and will find Resistance at 16756-17047-17314. For the week ahead, Nifty will find Support at 4849-4758-4675 and will find Resistance at 5030-5113-5198. All the recommendations reached their targets with the exception of HDFC which just missed the target by a small margin. The Star performers of the week were Bata and ABB.